As a regular contributor to Automotive News, cartoonist Leo Michael is one of the automotive industry’s sharpest comedic voices. According to his personal website, it was just something he was born with. 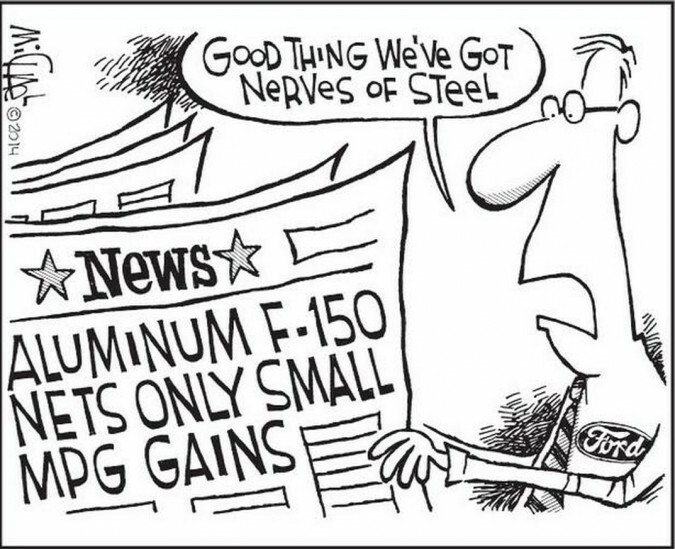 In today’s featured cartoon, Michael comments on Ford’s F-150 ballsy move to transition to aluminum, wondering why exactly it is such a big deal??? This entry was posted in Culture, Ford, Trucks & SUVs and tagged aluminum, cartoon, f-150, ford. Bookmark the permalink.